Re-fresh! Enjoy summer indoors. Combining refreshing hues and wonderful fabrics, this summer's slumber will be one to remember and attempt to repeat year after year. Enjoy this look book with bursts of beautiful bedding and know that this summer can be comfortably enjoyed. Not to be forgotten are our own-make down pillows and comforters and DEWOOLFSON'S signature duple silk bedding. Many hands work together to make a lovely bed and we believe the ideal foundations are our perfectly filled and stitched down and silk fillers. Curious to learn more about any of the linens you see on the following pages? 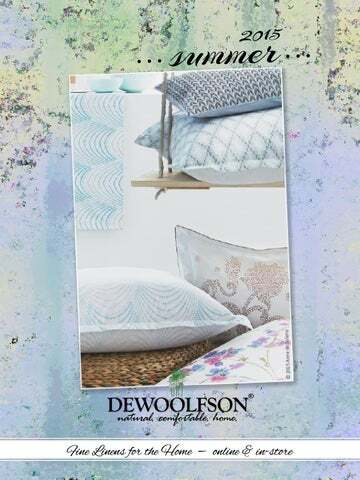 Click on the image and you will be taken to that page on our merchant website - dewoolfsonlinens.com. We hope you find our look book to be refreshing! DEWOOLFSON速 comforters, pillows, and featherbeds are individually filled and sewn from the finest materials and shipped from our North Carolina factory within 48 hours. We use only hand-select European white goose down or feather fills, covered with some of the world's finest European downproof fabrics, including your choice of cotton cambric, batiste, sateen, silk, and an eco-friendly organic cotton. Our comforters are available in up to five warmth levels, and can have additional down added anytime within a year of purchase (charging only for shipping and the cost of the additional down, by the ounce). Our down pillows are fully adjustable for firmness within a year of purchase (charging only for shipping and the cost of the additional down, by the ounce). As always, orders for custom sizes and fills are gladly accepted.